My mother, my aunt, and I were exploring an abandoned old house. To me, it was a fun adventure. To them, it was a bittersweet return to their home, now an empty shell that would never be lived in again…at least not by humans. As we approached the house, Mom commented on a stack of beehives placed nearby. “I wouldn’t be surprised if they moved into the house when they get a new queen.” And when she opened the oven, a little mouse peered out curiously from its nest, eyeing the interlopers. And we were the interlopers now. The house may have been built by man, but nature had claimed it for its own. While it was no longer habitable by humans, it made a wonderful home for other species. The debris we gingerly picked our way through made a dry, safe haven for mice and spiders. And the crumbling walls were fine for anchoring a bird’s nest. 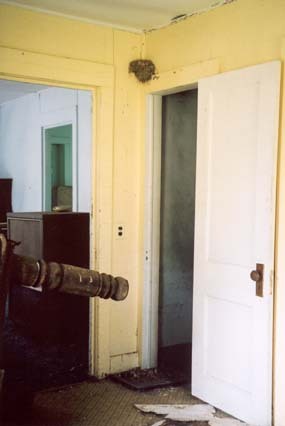 Granted, it appeared to be abandoned for the moment, but at least one pair of birds had raised a family there, and perhaps they would return, or another pair would use the nest or build their own. The house will continue to decay until it eventually collapses into the cellar. And the entire while and even after it finally collapses, somebody will be living there. Life goes on, in one form or another. It’s kind of reassuring.